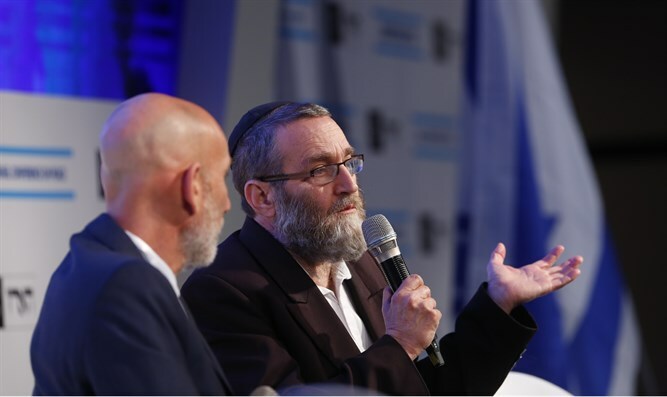 MK Moshe Gafni (United Torah Judaism), chairman of the Knesset Finance Committee, expressed his support for an agreement with the Palestinian Authority at the Israel Peace Conference in Jerusalem Monday. "I do not like the legislation that this government brings on all kinds of right-wing issues," Gafni said. "The first important thing is that the State of Israel be a Jewish state, otherwise we have no right to conduct negotiations with the Palestinians - they were here before us, we removed them from here," added Gafni. He hastened to add that "if we do not have the historical right that the Jewish people have here, we have no rights." Gafni explained that he does not promote political moves in the Knesset because the left does not support his positions on the Reform movement. "I do not sit with the Reform. The Reform movement caused the greatest damage to the Jewish people. I do not have an alliance. I have no one to say 'on the things that are important to you we are with you through thick and thin.' I told my opinion to Netanyahu, even in the Knesset plenum. On the political issues, I am closer to the left." Addressing the haredi demonstrations against enlistment in the IDF, Gafni said that the demonstrations were directed at him and the rest of his political party. "I'm part of the establishment, part of the system. They want us to not be there. I'm the first in the Knesset plenum to condemn those [extremists] who went to Iran. So what if they look like me? People need to make that distinction."